Designers of the “Don’t Mess with Texas” anti-litter slogan may not have been thinking of Texas prickly pear when developing the catchy phrase, but native cactus is nothing with which to dance the two-step. That said, it’s time to load up friends and take a road trip through the eastern portion of Cameron County for the annual display of these not-so-friendly, but spectacular, blooming native plants. 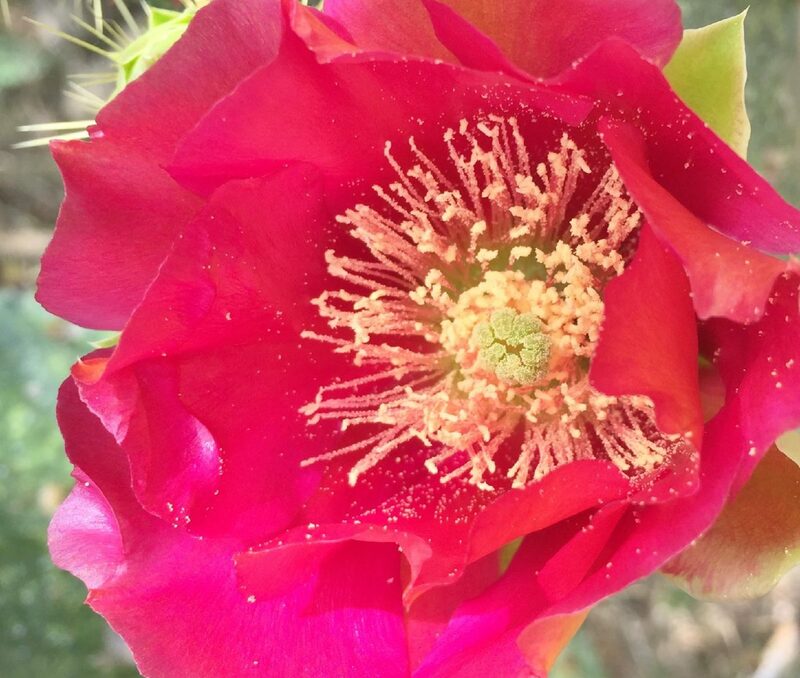 Texas prickly pear (Opuntia engelmannii) says Texas, loud and clear. The plants are popping out their luminescent yellow-green to canary-yellow blooms everywhere. If you want to see them sporting other colors, head east toward South Padre Island. Colors can range from red, to peach, pink, maroon, violet, tan, orange, mauve and colors in between. The easiest viewing is along the south roadside on state Route 100 between Los Fresnos and Laguna Vista, at the far edge of the road right-of-way. This year, a black wrought-iron fence marks the display. Slow down and enjoy miles of the changing palette of colors, then keep driving and enjoy lunch in Port Isabel or South Padre Island. If you stop along the road to take photos, do so cautiously. 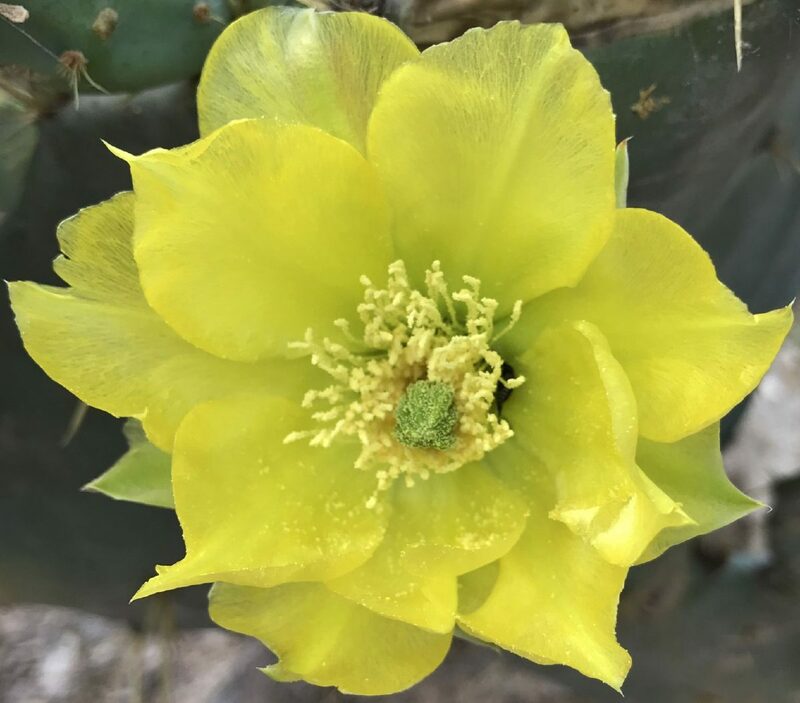 Other travelers may have different destination deadlines than appreciating this once-a-year Lower Rio Grande Valley Texas cactus show. 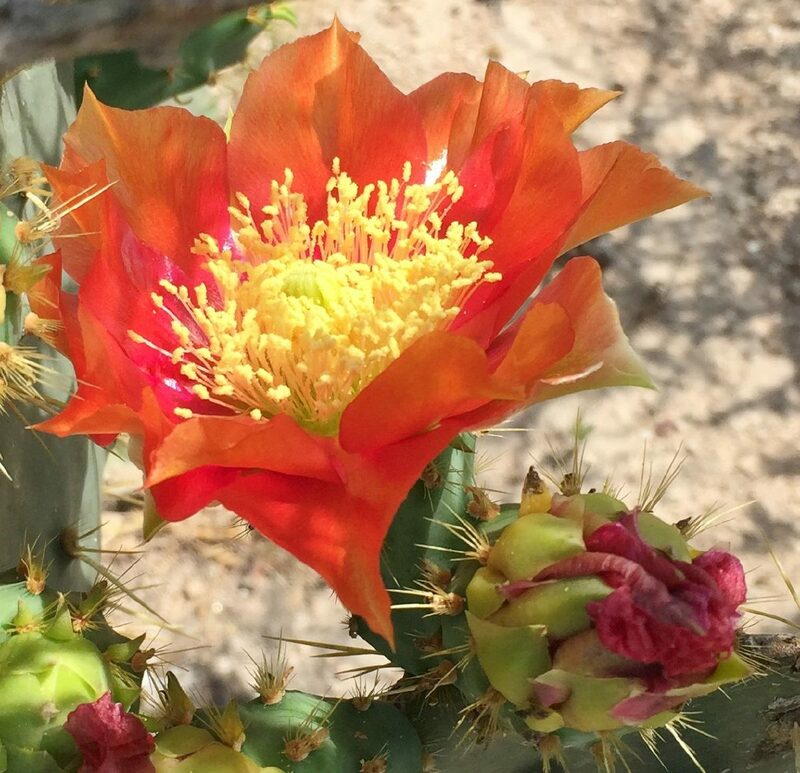 Wear sturdy shoes and consider bug spray if you get out of your car for a closer look, but beware of the cactus’ heavily-barbed and numerous brittle, sharp spines. Even the shorter, innocent-looking spines are barbed. The beauty and color variety of the flowers are worth the risk of a close encounter but perhaps more sensibly from the safety of a vehicle with a close-up lens on your camera. If you do get too close to the cactus spines, be prepared. Some of us who volunteer and help maintain trails in nature parks, carry a small cactus-encounter-kit. The kit contains at least two pairs of tweezers, angle-tipped and pointed-tipped, a magnifying glass and small flashlight with extra batteries. Cactus spines are best plucked out. Don’t attempt to swipe or brush off. 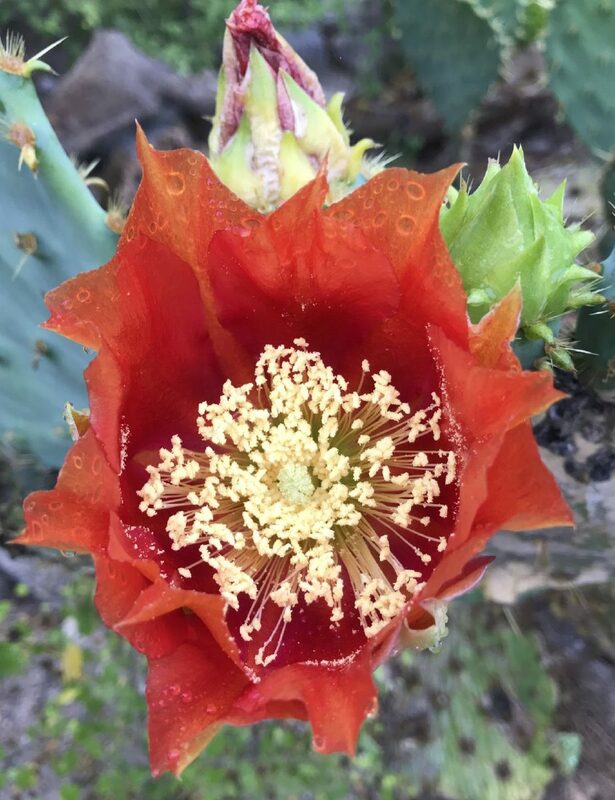 After the beautiful and intricate cactus flowers wane, fruits, known as tunas, will begin appearing. They’re green at first and will begin to ripen midsummer to a deep red color. They produce a very sweet, red-purple juice, a treat for rabbits, tortoises, ground squirrels, rats, raccoons, skunks, opossum, coyotes, deer and birds. Seeds from the tunas that pass through wildlife digestive systems help to readily increase the cacti population. Juice from the tunas has a high vitamin C content. The pads, or nopales, are rich in vitamin A. Both the tunas and nopales are a food source for humans as well as wildlife. Both are occasionally available at local grocery stores. For the adventurous road-trippers, pack snacks, beverages, binoculars, bug spray and bird guides and explore the Valley off the beaten path. This time of year, roadsides, irrigation ditch banks and fallow fields showcase our native plants and resident and migrating birds like no other time of the year.